After a particularly turbulent match, Harry Potter won another Quidditch game for his Gryffindor team. And once again, he did it by swallowing the Snitch, while falling off his broomstick. Unfortunately, this time he ended up landing on the broomstick's end. The disastrous result of the fall can be seen in the exclusive X-Ray image below, taken after the incident. The image clearly shows the Snitch as well as the broomstick inside Harry. 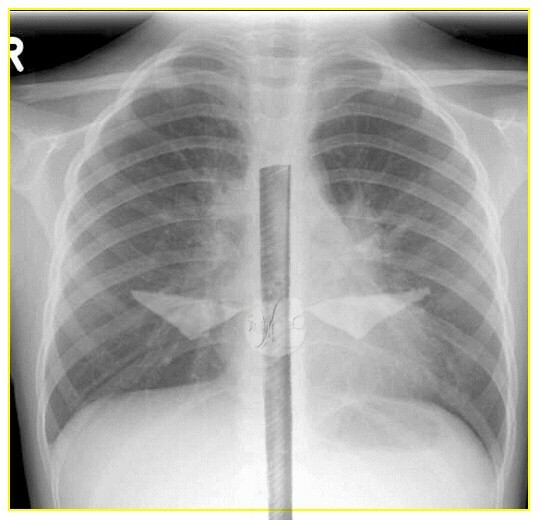 As the X-Ray indicates, the entry angle of the broomstick may have caused damage to the Snitch, besides making it less accessible. According to the official rules of Quidditch, if the Snitch is not recovered within a week, the other team wins. This may pose a tough dilemma for the Gryffindor house: which is more important - Harry, or winning the game.